A continent carved by rivers, dominated by lush jungle forests and dotted with ancient mountains. Your Kontor just established on a white sand beach, the first residents settle in your newly founded city and you take a moment to watch the Tobacco leaves grow in the ardent sun. The New World will leave a strong and vibrant impression and it was important for us that the new residents and their buildings invite the player to sink deep into the atmosphere of that beautiful continent. 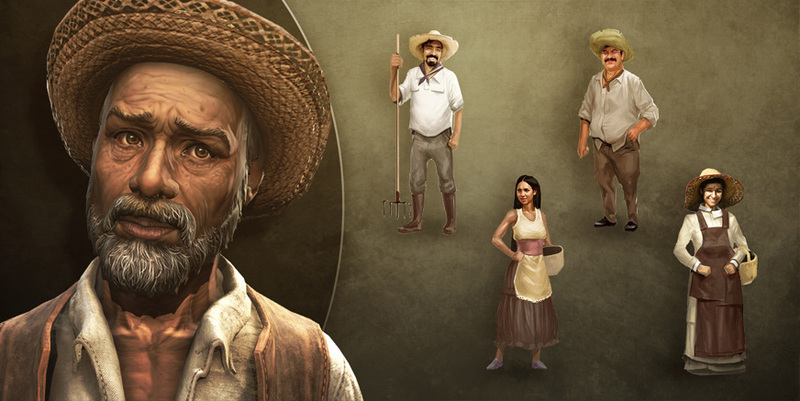 Inspired by 19th century Latin America, Anno 1800’s New World residents are bound to their country but other than the dawn of the industrial age in the old world, their story is a tale of building a strong prospering society fueled by the dream of independence. 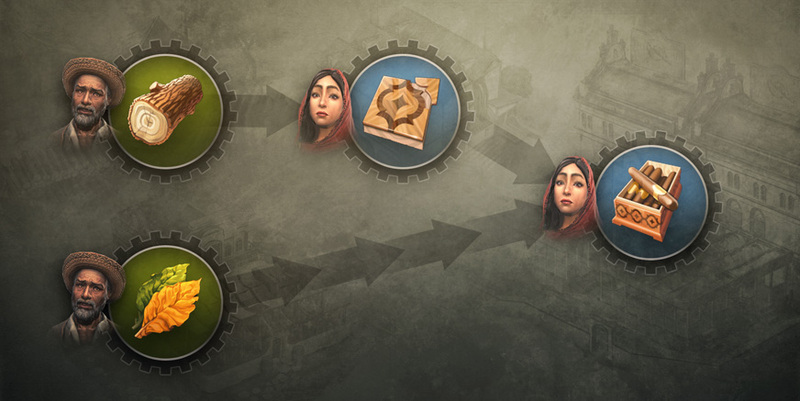 Beside a set of strong third party characters populating the second session, your settlements will have visual feedback representing residents local to the continent, including models, portraits for residential tiers and new production chains. Jornaleros are the farmers of the New World, devout and hardworking people who are driven by the dream of independence at a dawn of a new era. Their farm houses are rather simple but also a pragmatic fit for the hot and stifling climate of their continent. We wanted that their residential buildings convey that they are slowly adapting to a new life and are not built as a long-standing family heirloom. However, not many of them can call a farm their own and it is not easy to build a lasting foundation for a small home on the jungle soil outside of paved cities or large haciendas. 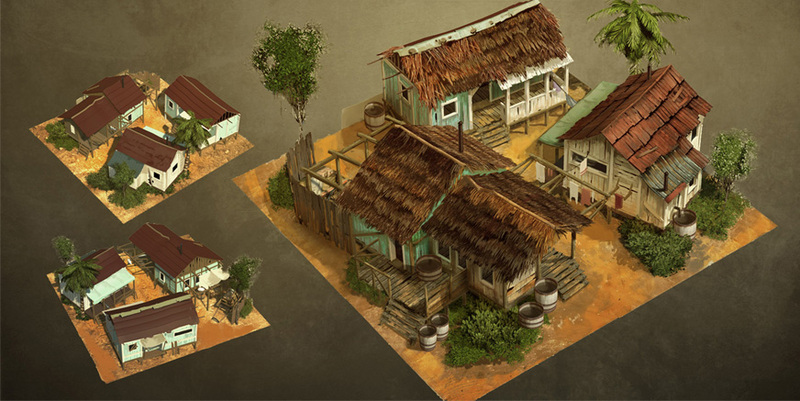 This concept art gives you a good idea about the flair of the Jornaleros homes. Cocoa, Bananas or Pearls, which seem almost ordinary to the Jornaleros, fetch a high price to fulfill the craving for anything new and rare in the high society of the Old World. But while they call even common plants like sugar-cane “exotic”, the life of the New World residents also changed when goods from across the ocean became an integral part of their life. Centuries of influence brought new goods to their continent, some of them now cultivated on their own land while others are in high demand as imported luxury goods. Rum export is big business in the 19th century, as there is a high demand for the drink in the Old world. When the power monopoly of the Old Worlds monarchy crumbled, the Orebros managed to take advantage of the new trading deals and connections to the rising class of financial entrepreneurs. Their new prosperity allows them to import expensive crafted goods such as sewing machines and they value a distinctive lifestyle based on old traditions, which grows confidently into a promising future. Their settled city lifestyle also offers amenities for their society, from healthcare provided by the local hospital to entertainment during a visit at the boxing ring. 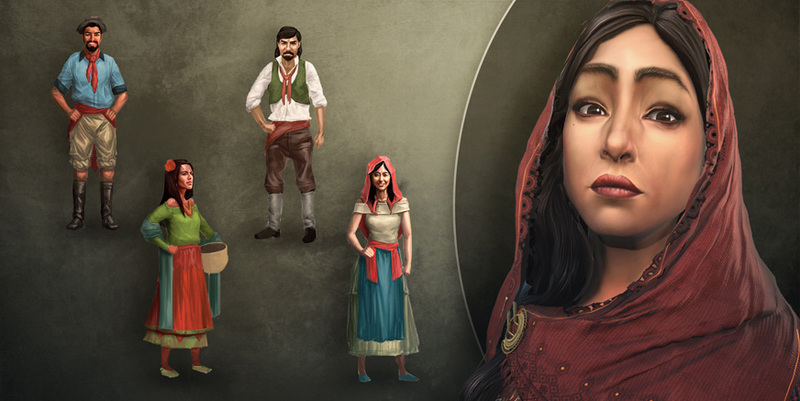 The Obreros are the residents of the new worlds who found their way from the farmlands into the cities, where they found wealth as tradespeople. Some of their residential buildings have a long history but over time, the Obreros gave them their own character. As many of the Obreros grow accustom to the city lifestyle, their houses were built with lasting stone and they are more likely to spend their new wealth on their homes for the generations to come. The residential buildings of the Obreros depict an urban lifestyle still fitted to the climate. The lounging investors and engineers in your metropolis cannot get enough of their imported cigars and chocolate but the real driver for the economy lies in precious gold and oil. Almost all goods you export into the Old World serve luxury needs and making your money aristocracy happy will challenge your smart management skills and require an elaborate trade network. Goods produced in the New World will serve as luxury goods in the Old World and vice versa. Gold is hard to get by, which results in a heavy demand in workforce for prospecting the luxurious metal in several mines in order to ensure a profitable output. But oil was the real game changer to bring progress and a thriving economy to the New World. While some few oil fields will be available in the old world to cover the need for basic electrical supply, you will need to tap into the rich oil resources of the New World if you want to support your power economy and make your investors happy. 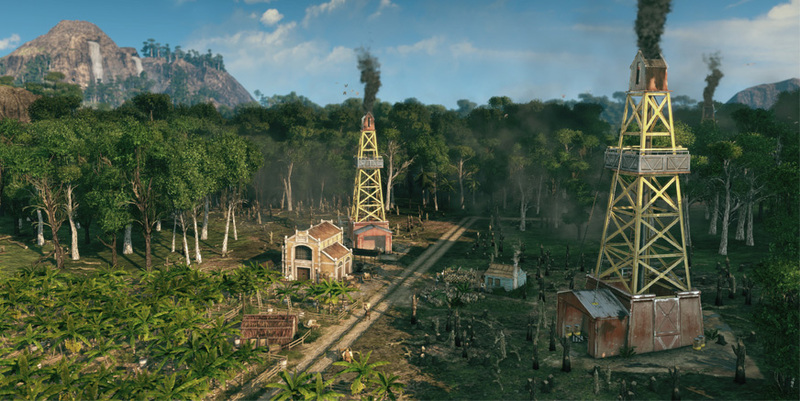 The oil towers surrounded by jungle provide quite a vista, but the fossil fuel not only wants to be pumped out of the ground but also conveyed to the oil harbor and then distributed in large tanks to your Old World’s metropolis. The New World will carry you away with its details, offer new and challenging production chains and invite you to meet a rich set of new third party characters and to explore it’s story in the campaign. But Anno 1800’s campaign is a story for another day and with that brief look over the two production chains, we bet you have many questions about the New World session. The end of September is near and we are about to wrap up our big gamescom feature list with this week’s blog about the New Worlds residential tiers and a brief look over the museum and the blueprint mode in the week to come. To give you a glimpse of the upcoming month, we are working on some exciting DevBlog topics many of you want to see for a while now. On another note, the next round of the Union focus test has started and we are looking forward to daily feedback reports from our testers. However, there is more to come, as the Union tests will be soon open for bigger groups, allowing the Union to test the game in a larger scope than ever before. We will also add the first Anno Fan Initiative pages to the website and if you are a fansite admin or content creator, do not forget to apply for the program! As we are also working on some fan resources such as wallpapers, are there some specific things you think are a must have or other material such as streaming layovers or even emotes you would like to see? I am curious how you manage the availability of expeditions and how many different missions you will have in the game? Answer: Reaching residential tier III will also unlock the Expedition feature. 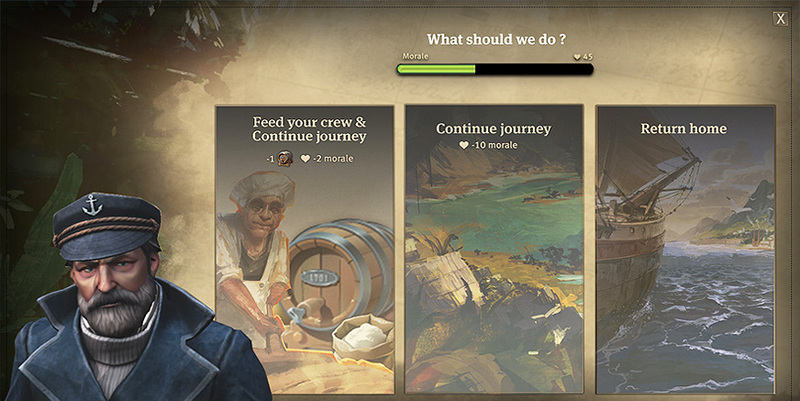 At that point, the captain will notify you about available ventures in the expedition menu. Expeditions will be randomly generated and spawn in intervals, while harder ventures will be available in the late game. You will be able to take on as many expeditions as you like, only limited by the currently available adventures. 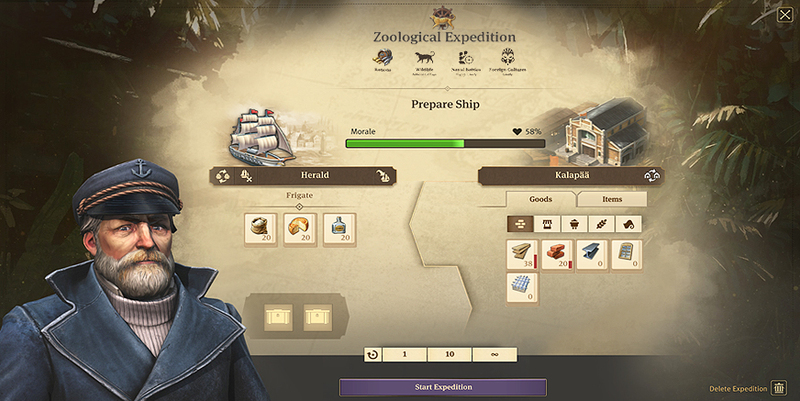 We have currently four main types of expeditions: zoological, archaeological, rescue missions and pirate hunts. For every type, we have a large amount of various events you will encounter, with the challenge and amount of the events based on the difficulty of the expedition. All together, we have a large amount of events with many branching choices, depending on which items you brought along the journey or how a previous encounter turned out. The expedition window will only give you an idea about the difficulty, type and likeliness of challenges you might encounter during an adventure, which gives you a chance to prepare, but only hints on the various possible encounters. I really like the idea of the expeditions, but I have a couple concerns about how they will exist in the game. Are the expeditions going to be necessary to core gameplay? Or will they just be an extra thing you can do if you want some rarer items? Will expeditions be as useful or interesting in the late game? Are the rewards potentially game changing? Answer: There will be various alternative ways to get your hands on items, such as trading with neutral factions, quests, the tourist harbor or the world fair exhibitions. 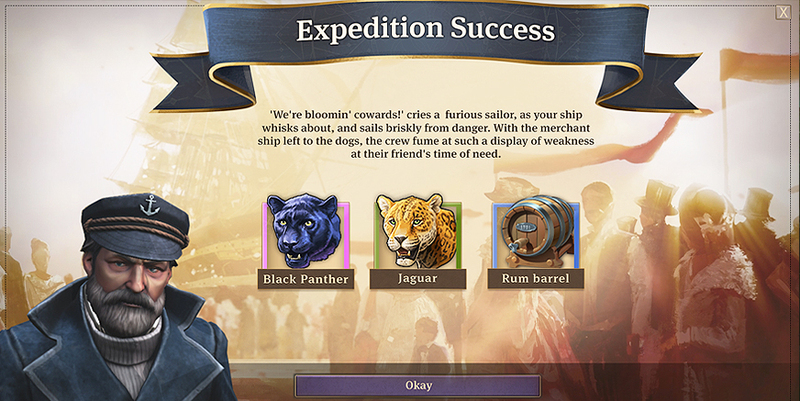 The items you can acquire through expeditions are based on their various types, with the focus being animals, cultural artifacts, specialists and military equipment from pirate hunts. While you will have alternative ways to get your hands on all these item types, expeditions will be the only way to get the rare animals and artifacts for the zoo and the museum specifically. That means that if you want to have a collection of the rarest exotic animals in the game, you will need to take on challenging expeditions. Drop rates of items are based on expedition type, climate, rarity stat and difficulty of the Expedition. Which means that a rare black panther have always the same chance of dropping in a hard zoological expedition to the new world. Furthermore, you will always get three items from the loot table with every expedition. Bottom line: they will be a risk to acquire but you have an idea about what items you can get when choosing an adventure. 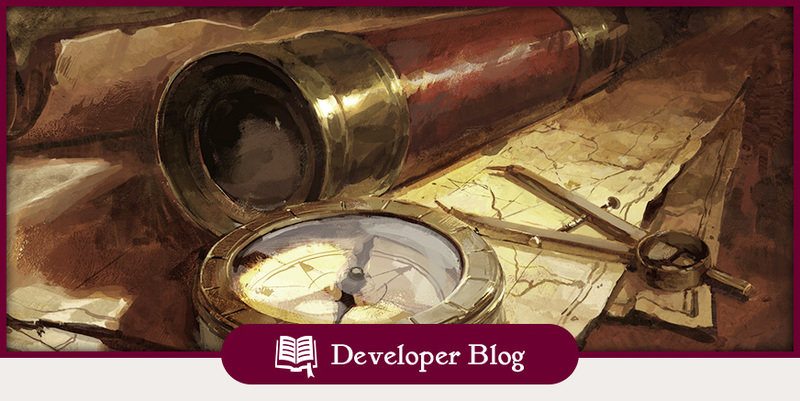 We don’t want that expeditions are a necessary feature for Anno’s core gameplay and we will also make use of our Union focus testers to see if the feeling and the balancing is right. How will you notice that you already got a reward from an expedition before finishing it? Answer: The rewards for the expedition will be always granted at the end of an adventure. First, your ship will travel to its destination and when arriving at the marker, encounter various events, which you have to go through. During the events, your morale bar will sink but you will be always able to send your ship back after every encounter. If you send your ship back, you will not get any rewards from the expedition itself but will keep items you acquired from succession in special event encounter. These rewards will be immediate granted after the specific event encounter and therefore, you will be always aware if you got already items, which might be worth saving before finishing your expedition. Is it possible that an Expedition has a negative effect such as bringing back an illness to your island. Imagine you don’t have enough doctors in your city which leads to 20% of your residents dying while if you have a good medical supply, only 5%? Answer: Expedition events won’t influence your city, economy or have any other effect on gameplay elements outside the expedition itself other than the items you get as a reward and can use in your city. While Expeditions are an exciting feature to explore the world of Anno and to refine your gameplay with items, we do not want that they become the central gameplay element for Anno 1800. I think it would be interesting if various original scenarios from the expedition which actually happened back than would be used for inspiration such as the competition to reach the South Pole of the Asmussen and the Scott. Will the background artworks for the expeditions represent the specific region and climate? Answer: Many of our Expedition events are inspired by actual adventures, scientific journeys and stories from the 19th century. We will send you to various climate zones, represented by the markers on the world map, artwork and their own specific encounters. You often talk about difficulty levels, which was a thing in many Anno titles before. Will we be able to customize our own difficulty by altering parameters, such as the likeliness of fire, or will the game just have preset difficulties? Answer: We will have three difficulty levels in the game: Easy, Moderate and Hard. But as the sandbox experience is part of our core DNA, you will be able to create your custom game rules affecting many different parameters of the game world and the AI. How does the idea of an own blog showcasing the customization options of a match sounds to you all? By the dawn of the 19th century, the majority of the globe had been accessed by various trade conglomerates and empires, but there were still curious adventurers willing to conquer our world’s final frontiers and history’s last big secrets. From the journeys of Charles Darwin and Alexander Humboldt to various novellas and tales about curiosity, bravery, and hardship – we had plenty of material to inspire Anno 1800’s new Expedition feature. Expeditions allow us to experience the world of Anno from a completely different perspective from our usual view through the lens of an architect. From dangerous scientific expeditions to the arctic regions, exploring the heritage of old civilizations hidden in dense jungles or the hunt for infamous freebooters, playing through these exciting stories will reward you with precious and rare items. These can be anything ranging from exotic animals for your zoo or artifacts to be displayed in your newly opened museum to specialists who can boost your productivity, accompany you on future expeditions or even lead your flagships as seasoned naval veterans. However, these undertakings were never without risk, and many scientists and explorers paid the ultimate price to follow their dreams; similarly, some of these dangerous ventures may pose a grave threat to your ship and crew. The new Expedition feature adds “choose your own adventure” style quests to Anno 1800, where you send a ship and it’s crew on a journey with an uncertain outcome. During that adventure, your crew will encounter scenarios based on the type of expedition, and you have to choose wisely how to tackle these events to guarantee a safe and rewarding outcome. There will be a variety of expedition types, such as archeological, zoological, rescue missions or even bounty hunting pirates. Available at the third residential tier, these adventures will become available in your expedition menu and as a marker on your world map. Here, you can also see the title, type and difficulty indicator for each expedition. Naturally, lengthier and more dangerous expeditions will offer higher rewards for the risks you have to undertake. There will be many different stories with a variety of events to play through and you will be able to run several expeditions at the same time. Once you have decided which journey you want to undergo, you first have to prepare your ship. The moral bar of your expedition serves as a health bar during the long journey into uncharted waters. The moral bar is a combination of the ship’s basic morale rating as well as the various items on your ship, including rations, goods that provide special abilities and any specialists who join your crew. The general rule: the higher the morale, the more likely it is that your expedition will be successful. Your seasoned naval advisor provides you with information about an expedition, such as potential rewards and the types of encounters you may face. And there will be plenty of those- from foreign cultures which require diplomatic tactfulness, to diseases which can befall your crew to superstitious rumors about stranger things which befell the last unlucky souls who sailed through that mysterious passage, our expeditions can get pretty eventful. If items are a good fit for the challenges you can expect on an expedition, they will provide a significant boost to your morale bar. Specialists with diplomatic experience might help you out with foreign encounters, canons or an experienced cannoneer will help against hostile ships and extra rations will help to endure the month long trips on the high seas. As soon as you loaded up your ship with specialists and other items based on the Captains recommendation, you are ready to send the brave crew on to their journey and your ship will leave your session in real-time until entering the world map. There, it will travel to the expedition’s destination, indicated by a marker and a line showing the ship’s course. Events – Captain, there is land on the horizon! During their journey, which will take time based on the distance to the destination, events will happen, which are more frequently and challenging based on the expedition’s difficulty rating. These events will each have their own story and different stages, based on the decisions you make and their outcome. The key here is that almost every encounter has multiple possible outcomes, both joyful and negative. The decisions you make and even the items you brought with you can have an impact on the said outcome. The chance of success is affected by the quality of your items, as your specialists, the ship itself and other items and goods have their own skills and modifiers. Let’s look at the example. Your ship took serious damage during a gruesome storm, but a carpenter might be able to repair it with his skills and some wooden planks. You have neither the needed material nor the craftsman to fix the damage? It might be worth taking the risk to ask for help on the mysterious island on the horizon. You may even boldly decide to ignore the damage altogether and just venture forth, even if your crew’s morale will take a heavy hit from travelling on a damaged ship. As mentioned, Characters can have special traits, such as an anthropologist who can help you when encountering foreign cultures, which might lead to unique decision options based on the traits of said specialist. Example: We have an event in which your crew makes landfall on an island in search of potable water and while doing so, meets a native tribe who currently performs a sacred ritual. A tricky situation as you don’t want to antagonize the inhabitants of the islands. Luckily, as your Anthropologist spent years studying foreign customs, he can show respect for the tribe by joining their ritual, which will reward you with a special item if successful. Sometimes, you might have the perfect item to solve a tricky situation, which will enable a special decision with a guaranteed chance of success. But even some basic goods can help you through certain scenarios; for example, soap gives a bonus to medicine, wooden planks help if you need to repair your ship during an event and the trusty parrot gives you a bonus on faith when “pining for the fjords”. In the spirit of the great scientific journeys of the 19th century, there is always something at stake but a higher skill rating can weight the odds dds when making decisions. Failing events or ignoring them when you are missing needed materials and skills will cause a hit to the morale of your expedition. On our “Love Island” expedition shown at gamescom, an encounter with a tribe’s chieftain could lead to various outcomes: if you are lucky (or well prepared), one of the tribesmen might join your crew as a specialist but if Lady Luck is not smiling upon you that day, an ill-timed “knock knock joke” could even cost your comedian her life. Space is also precious on your ship, as you might need to leave someone behind or throw goods overboard in order to make space for that rare reward which you managed to catch during an event. Going through events during an expedition costs morale (even during events with positive outcomes). All food and drink related goods you have on your ship count as rations, and after every event, you will be able to spend extra rations to lose less morale. The morale will sink over time or even suffer greatly when facing grim circumstances. If the morale bar falls to zero before you finish your adventure, the expedition is lost – including your ship, your crew, the precious schnapps, and even any trusty parrots you had with you. But you are at the helm of your ship and if you feel that the risk is too high or that an expedition may take an unfortunate turn, you can always recall your ship from an active expedition. When finishing an expedition, you will be rewarded with several rare or even legendary items. Every expedition has its own loot table based on the difficulty and the type of the venture, such as archaeological expeditions giving you a guaranteed cultural artifact if you succeed. Furthermore, individual encounters can also have their own loot tables or grant fixed items for specific outcomes, which are separate from the rewards for finishing the overall expedition. The rewards for finishing an expedition can be rich and plentiful, and we are looking forward to reports on your adventures and players comparing their rare items. Besides items you can get from the event encounters themselves, expedition loot will not take up any space on your ship to make sure that you receive the deserved loot for the efforts you went through. After finishing the expedition, your ship will return to your main island and dutifully unload your spoils into your imperial harbor. Expeditions are an exciting new feature that allows you to enhance your city-building experience with opportunities to get deeper immersed in the world of Anno 1800, while being able to snag some helpful items and specialists along the way. As a team, we can’t wait to hear your thoughts, and to read the first tall tales of players relay their expedition (mis)fortunes and what spoils they managed to bring back home to their islands! What do you think of the expeditions? What stories and adventures do you want to see? And what kind of rations are the best for long expeditions? Let us know in the comments what you think. A new week has arrived and that, of course, means that a new Union Update chock full with Anno wisdom is here. 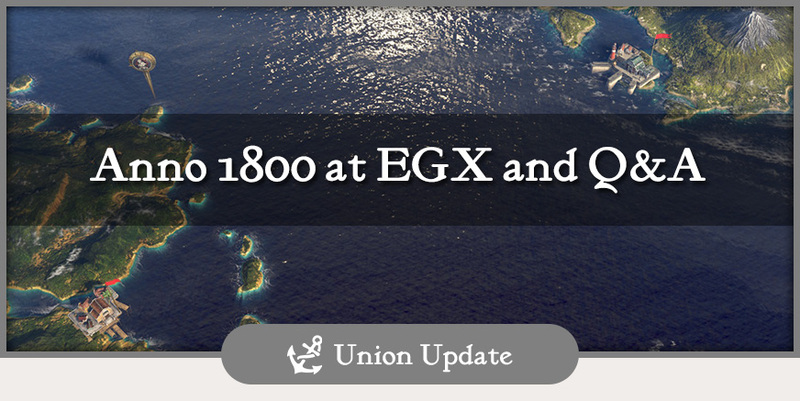 Before we start the promised elaborate Q&A Session, let us first make you aware of two possibilities to see Anno 1800- live and in glorious color! Also, as a heads-up, in this week’s DevBlog we will dive into the world of Expeditions. We’re at the EGXs – Plural! But wait, there’s more: We’re also happy to stop by the first EGX in Berlin! Our presentation where will be on Sunday, the 29th of September and it’ll be live at 5PM on Twitch, so mark your calendars – or even better: Visit us! Enough with the prelude – you have questions and we’ll try to give you answers! There were a few Anno T-Shirts at gamescom. As I didn’t have an opportunity to get one, I’m asking myself if it’ll be possible to get merch at some point, especially T-shirts? Answer: The number of our gamescom shirts was very limited and the demand was huge, so we don’t have any shirts left. We’ll keep the interest for the shirts in mind for the future, however. Will there be visible ship crews? Answer: We often hear the request for crews being visible at work on their ships, due to our love for detail and visual feedback in the cities, similar to how you are able to see your citizens doing their daily work. While visual feedback taking the form of crewmembers is technically possible, the implementation would be very time-intensive and require us to overcome a few technical hurdles. One of the reasons for this is the size ratio. As you might be aware, the citizens of our Anno world need to have a good mix between visibility and realism, so there won’t be realistic size ratios all the time. And while the ships in Anno 1800 are bigger than ever, the ratios are not necessarily the same ones as with buildings and streets. In short: The characters on the ships would have a different size as the ones in the city, as they would otherwise look out of place – especially when your ship lies in the harbor. But there are other points, which made us decide against the visible crew. We wanted a big list of varied ships and ship types and having the crew would’ve possibly been at the expensive of ship variety. Visual feedback of the units you move around in fleets can also be taxing on the eye and make the game seem visually restless, even chaotic. And the further visual feedback that needs to be calculated would also be a strain on performance – and these are just a few points, that we have to take into account when thinking about these decisions. As you can see, in production we always have to evaluate if the benefits of a feature outweigh the disadvantage or justify the expected effort at the expense of other content (which we could work on instead). Is it now not possible anymore to play a game without switching sectors? How is it looking with moving buildings around, can you move them anytime or just for a short time after building them? Will this option have any impact on the difficulty, like the reimbursement of building material in 1404? Answer: There will be no limits as to when you can move a building. And while the moving of a building is going to be free on lower difficulties, on the higher difficulty settings there will be a cost in building materials. I’m happy that aside from the Darwin Temple, we will also get an altar for the achievements of the „two-legged burrowing mouse“ to expand the cultural diversity of our city. The only question, will space be enough for that? Or will there be revolts due to lack of living space and resulting higher rent? Answer: Juggling available building space with the needs of your city is one of the core challenges of Anno and of course this won’t change with Anno 1800. Depending on difficulty (which can also influence the size of islands), it can be a challenge to get all the necessary buildings on one island. Ambition plays a role here too, such as deciding whether you want to just have a small “alibi zoo” or push the module system to its limits. In the latter case, you can build museums and zoos that could cover smaller island all by themselves- provided of course that you manage to find enough attractions to fill them with. We leave the worries about ever rising renting costs to the grey reality, however. Will there be an Open Beta before release or a Closed Beta for pre-orders? Is day night cycle present in the time of release? Answer: We know that the day/night-Cycle is a beloved feature that also has a lot of fans here on the team. However, we won’t have a day/ night cycle in the game at launch. What really bugs me is the hustle and bustle in the trailer. The graphics are breathtaking, but more people on the street would be nice! Is there going to be a change there? Answer: Our work around „Visual Feedback“ is not yet done, so don’t consider anything you have seen final. Additionally, when we create a trailer (which have so far all showed actual game graphics), we often have to change the settings of the feedback units, so it can sometimes happen that the trailers show fewer units than you would see during gameplay. The question that burns inside of me is if we (the Union) will be involved with future DLC? Those could be planned already with some feedback. Answer: That is the case already! As we are only now starting to throw around ideas and plans for more content for the time beyond the launch for Anno 1800, we will definitely keep close tabs on Union and community feedback – as was the case with our recently announced Anarchist DLC. Here, the fan feedback in combination with the character’s gameplay potential made it an easy choice to include in the game down the road. We want to stress however that it will not be a “Day 1 DLC” – work on the Anarchist will start once the main game is done and we plan to launch it a few months after launch in spring 2019. How can I react quickly if something happens in the world, where I’m not looking at at the moment? An attack? Are resources missing in a settlement? Answer: With two sessions with one or more settled islands each, it is indeed sometimes possible to somewhat lose track – especially if you also want to keep an eye on various ships and running expeditions. That’s why we put a lot of effort into our notification system which will keep you up to date on important or critical information and developments. With one click, you’ll immediately hop to the place that’s in need of your attention. I think that you should reconsider the settling of the new world. I don’t think that having the AI wait for the player to settle before they move in is the right way. Answer: Our train of thought here was that we didn’t want to pressure players or give you the feeling that you have to explore the New World as soon as possible if you don’t want to lag behind the AI. However, after seeing the largely unanimous feedback on this matter we sat down again to discuss it, and have decided to change this slightly. Whether the AI characters will wait for the player before exploring the New World is now based on the difficulty level. 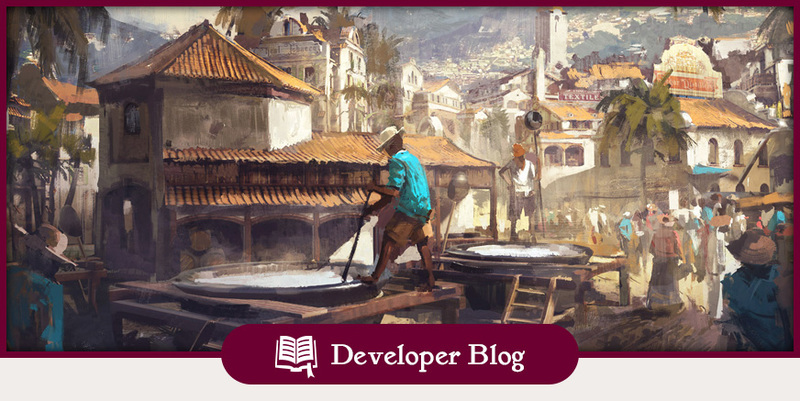 The idea of splitting the game world into the orient and occident quickly became a fan-favorite feature in Anno 1404. With Anno 2205, we expanded on the idea of different biomes and created the multi session system, which allowed us to ramp up the scale of Anno’s world with separate and vastly different new habitats to colonize. 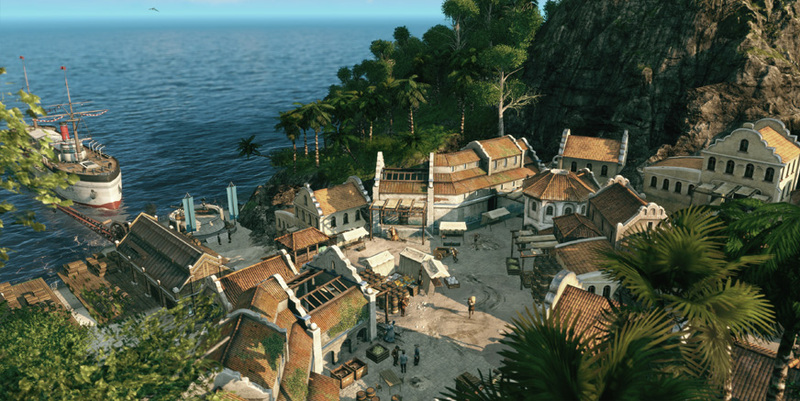 With Anno 1800, we will combine the best of these two worlds: a new biome and culture brimming with details on a large separate map on which your empire and your opponents can compete over new islands and resources. Welcome to the New World! 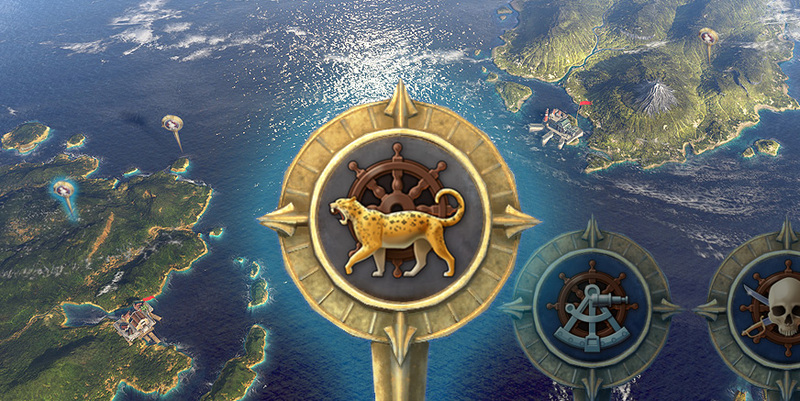 This new fascinating archipelago will both challenge your skills as a city planner and allow you to exciting new characters; who knows, you may even be able to help them in their struggle for independence as part of Anno 1800’s campaign! But keep in mind that characters from the Old World will also follow your new trade routes and bring your existing feuds or alliances into this lush new world. 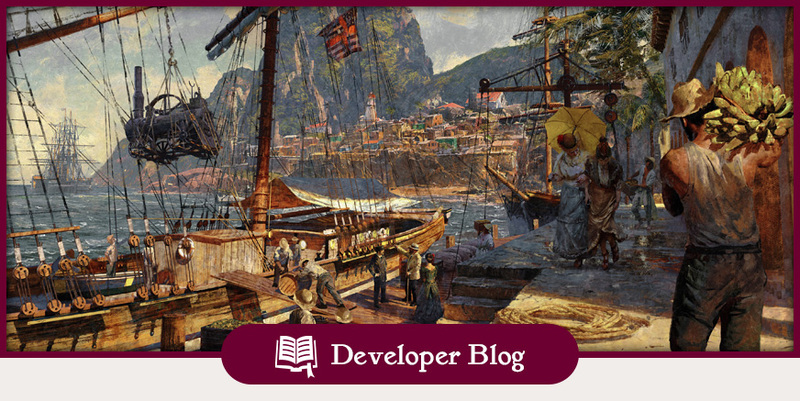 This is the first DevBlog in a two-piece series, covering the “New World” session in Anno 1800. Today, we show you the scale of the second session including the setting and gameplay elements. In a future second blog, we will focus on the new production chains as well as the new residential tiers you will find on this new continent. At the dawn of a new industrial era, which would eventually pave the way for our modern globalized world, people craved for anything new and rare from continents they’ve only heard of in their local newspapers. The rise of the working class and private entrepreneurs fueled not only a craving for luxurious goods but was also fertile soil for the curiosity first sowed during the Age of Enlightenment. But getting your hands on goods like cotton, tobacco or precious gold is a bold venture, as your competitors never sleep, and the islands at the coasts of the new continent are covered in dense jungles interlaced with rivers and rocky ridges. However, the New World will not only present a welcome visual change to the familiar European style environment of the Old World, as the second session will also spice up the gameplay with often challenging islands layouts. If you manage to establish your empire in an area, which seems inaccessible at first glance, you will be rewarded with a gorgeously scenic settlement surrounded by lush forests and colorful animals. To immerse you in that completely different hemisphere, we created two new residential tiers (both of which come with unique production chains! ), new characters to interact and new sets of flora and fauna, which will populate the densely covered islands. 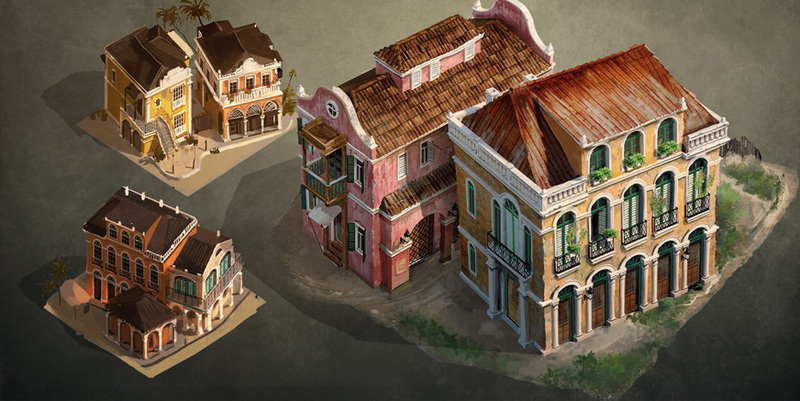 The two residential tiers are inspired by 19th century South America, including unique portraits, visual feedback as well as new third party characters like Isabella Sarmento, who are coming with their own islands, storylines, and quests for players to undertake. And while we can’t go into this topic too much yet, we can tell that Isabella’s fight for independence will play a focal role in Anno 1800’s campaign. But how will it exactly work? As previously mentioned, the new session is the best of two worlds: the Anno 2205 multisession system and the visual and gameplay variety from Anno 1404’s orient and occident. As soon as you reach tier 3 (Artisans) in the old world, a discovery mission for a new route to the New World will become available. 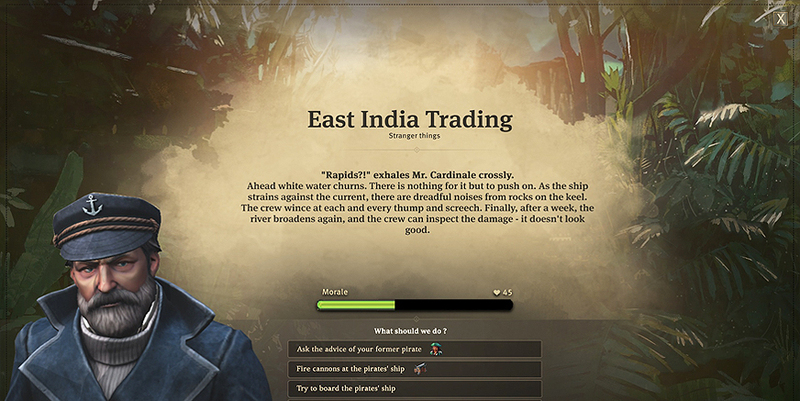 After your brave crew manages to open the new trading route across the great ocean, you will be given free access the new session as you please – seamlessly and without lengthy loading times, which is something we had received a lot of feedback on. From there on, you can jump back and forth, managing your empire in the Old World while changing to the New World in the blink of an eye to check on your newly established settlements. When sending ships between both sessions, they will leave the map in real time before entering the world map, which allows you to keep track of your trading ships traveling between sessions or your expedition vessels on their way into unknown waters. When establishing trade routes between sessions, you also have to take into account that your ship will take some time to cross the ocean. While the New World will offer exciting new production chains, you can decide for yourself when and with how much dedication you want to tackle this new adventure. AI opponents of the Old World will follow your new trade route but will not discover it by themselves. That means that you can decide when it is time to branch out without being afraid that you are too late to the party. Then it is up to you if you want to spread your empire extensively into the new territory or if you just want to establish a small romantic settlement to stay in contact with local characters. Many new Third Party characters are eager to trade their new goods with you, naturally, and for a price reflecting their considerable expenditures. But word is that Madame Kahina in the Old World has extensive contacts to the new continent and might strike a deal with you if you need some of the goods from these far away lads. Especially your higher tier residents in the Old World love to get their hands on luxurious goods from the second session while your residents in the new lands in turn favor imported goods from your first session. Furthermore, the New World will be the main source for oil, and a steady supply of the fossil fuel from the second session comes in handy when you want to run a big electricity business. 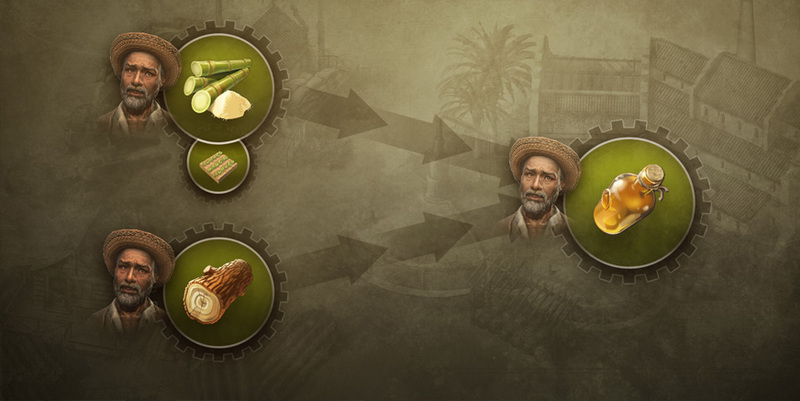 But more about production chains and goods in the second part of the New World blog. Now that we have revealed the New World, we can also tell you how player feedback was crucial into turning it into the version you will see at launch. Our initial concept for South America was very different and definitely smaller in scale, but the strong, constructive feedback from our Ann o union testers in our previous playtests convinced us to expand our plans for the New World significantly: a lush new world of challenging islands with two separate citizen tiers with all-new production chains. This has been a truly collaborative effort between our team and our playtesters, and we are grateful both to them, as well as to all the other Union members who shared their wishes and suggestions for the second session and its gameplay with us online. And while we are on the topic of your feedback- we are happy to announce that after we put some additional work in, you will be able to access both sessions in your multiplayer matches, giving you and your competitors access to the full breadth of Anno 1800’s world when facing off. In the next episode of our New World blog, we will show you the two residential tiers and their production chains in action. A lot of feedback and a great amount of work went into that feature and we hope that it will provide you with many hours of exciting new content. So what do you think? Let us know in the comments below! Many of our fans have been travelling with us on the Anno journey for the past 20 years. And as the Union has clearly shown, our communities are not only amazing at providing impressive amounts of invaluable feedback, but they also run many cool projects like fan sites or Discord channels, or create entertaining videos, fan art or whole short stories. No matter what you do, the Union Fan Initiative is here to support fan creations with spotlights on our upcoming Anno Union fan creation list, streamer and Youtube highlights as well as offering general support for projects through visibility on Anno Union and on our social media channels, hosting for Anno streams on Twitch and much more. You missed AnnoCast05? The VoD is now available! After the big gamescom reveal, we are considering bringing you these developer streams more frequently. What do you think about that and are there other formats on our Twitch channel which you would like to see? We have another small throwback to this year’s gamescom for you. 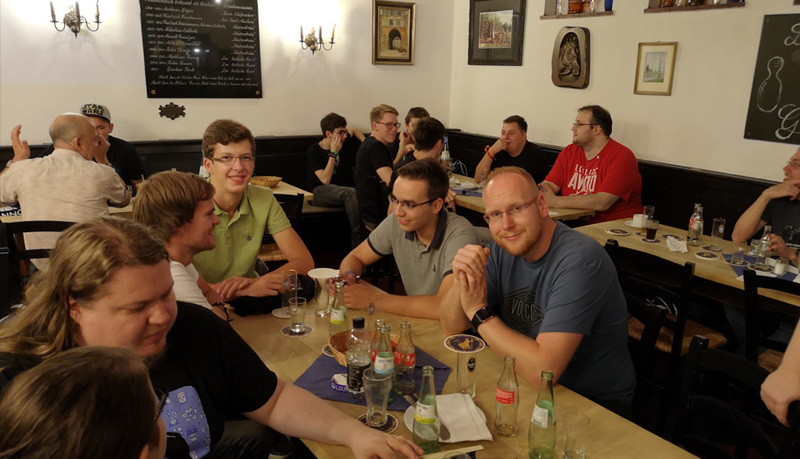 Here is a small personal report from our Anno Star Player and avid Union member Swimming-Paul, who was invited by Ubisoft to enjoy gamescom 2018 and to celebrate the games with us! 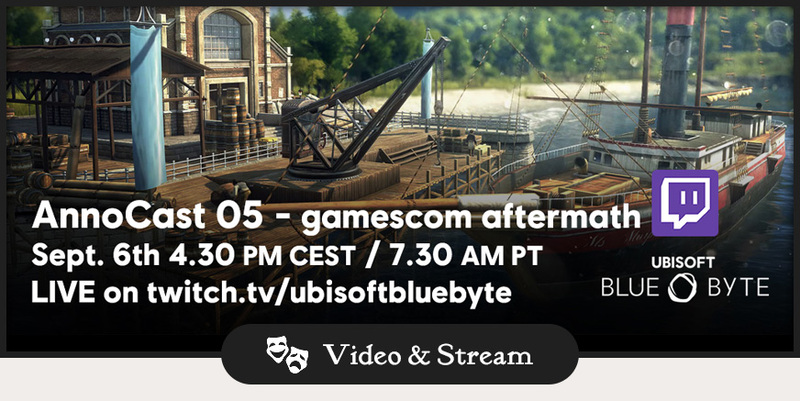 I have been playing Anno for over a decade now and an active member of different community platforms, but I would have never imagined that my love for this franchise would get me invited to join Ubisoft´s Starplayer Program or to visit Gamescom last August. One of the biggest highlights was of course to try the new demo of Anno 1800. Any other fan out there will agree with me when I say that 20 minutes is a ridiculously small amount of time to test a game like Anno, but believe me: it was a satisfying and rewarding experience. If I´m completely honest with you, I was so thrilled to see that rivers are coming back to Anno that I spent a considerable amount of time building bridges everywhere! But I also reached the 2nd population level, created a small industrial district, and admired the extreme beauty of this new title. I can promise you that Anno has never looked any better! 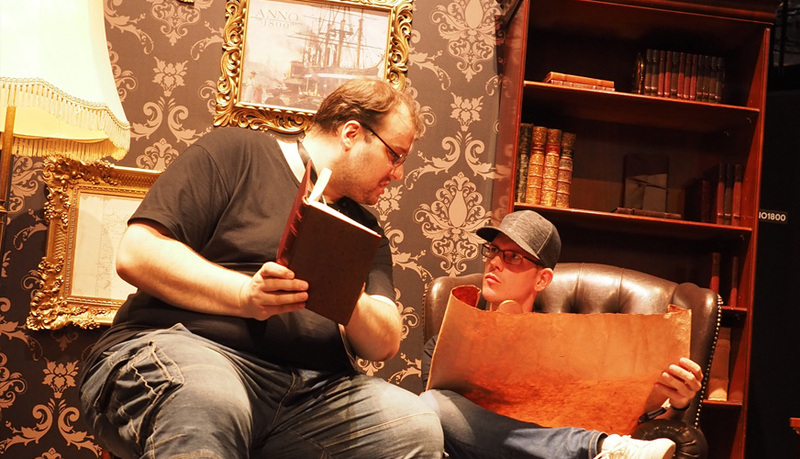 It was also very special to witness the official presentation of Anno 1800 in the Gamescom´s main stage. I don´t really speak German, so I couldn´t understand much, but that didn´t stop me from being the proudest fan in the crowd, enjoying the impressive new trailer and watching Bastian doing his thing. Finally, the Anno Union dinner was probably the best moment of the week for me. I would have never thought that awkward glances or uncomfortable silences are an option if you put together a bunch of Anno fans, and I was 100% right. After five minutes the conversations were bustling, the glasses were rising in a toast to the Best PC Game Award, and you could feel a shared passion and excitement in the air. It was a beautiful experience and I will never forget the people I got to know during my time in Germany. We do have many reasons to celebrate Anno 1800! Our Ubisoft StarPlayers gfrew, Swimming-Paul and Freeway enjoying Anno 1800 at out big gamescom booth. Of course, we have more planned than just supporting fan projects and content creators: you can also look forward to the first Anno 1800 wallpaper and more material for fans in the weeks to come. This week’s upcoming DevBlog “The New World” will answer many of your questions about the second session, and we are already curious about your thoughts. 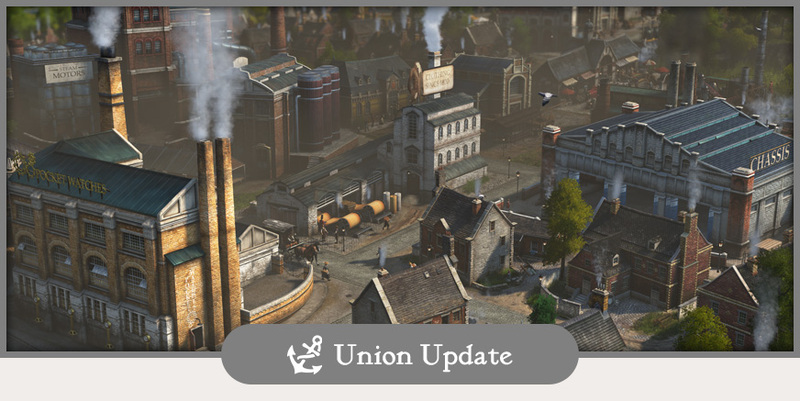 The focus of next week’s Union Update will be a bigger Community Q&A panel, which will cover questions from the Union, our communities, the stream and what might come up during next week’s DevBlog. And as always, give us all your feedback, wishes, suggestions or just good Anno vibes in the comments below. Alternatively, you can just watch the stream here in the Anno Union! 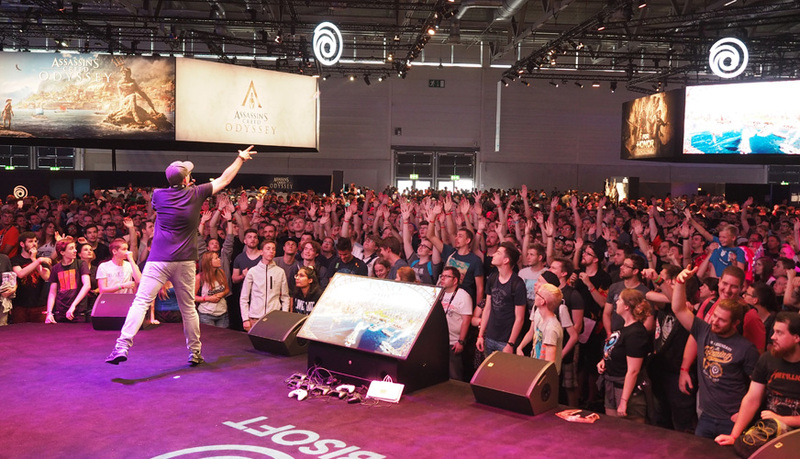 Another gamescom is in the history books – and what an amazing show it has been for Anno 1800 and the team here at Ubisoft Blue Byte! With so much going on, let us recap all the things you may have missed and give you peak on upcoming content! Let’s start with the biggest news coming out of gamescom 2018: Anno 1800 will ship globally for Windows PC on February 26th, 2019! To properly celebrate this news, we also had a new trailer that gave you a first glimpse of a new world to explore. With the release date out in the open, many of you have been asking how and when you could be buying Anno 1800. And the answer to that is… you can pre-order it now, in up to three different editions (based on your location). 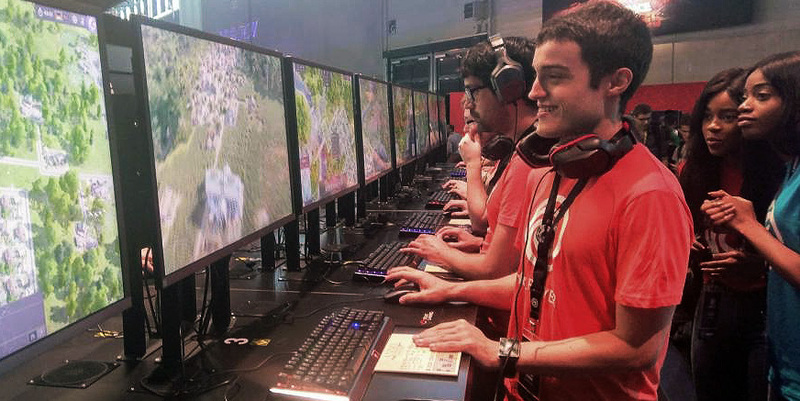 gamescom started in the best possible way for Anno 1800, with an expert jury awarding us the prestigious “Best PC Game” award. As you can see, we were rather excited! And to cap it all off, Saturday saw Ubisoft win the fan-voted award for the best developer of the show. Thank you so much for your support and votes, we couldn’t be happier with the reception of our game! Anno 1800 is great – but do not just take our word for it! 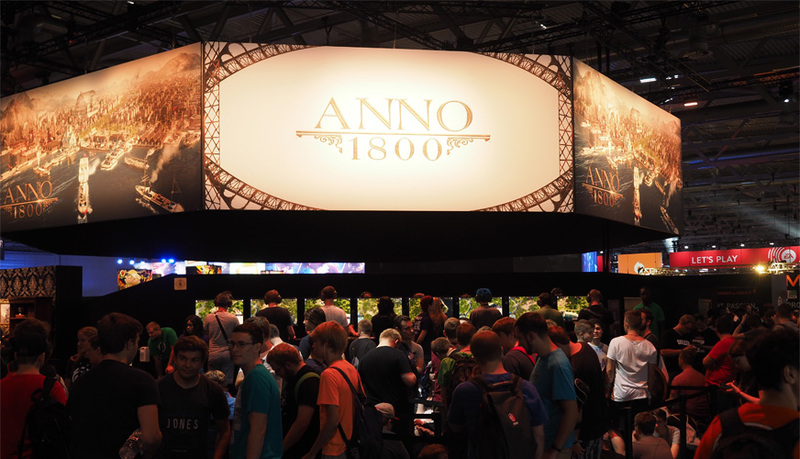 But probably more exciting than anything else during the convention was our big Anno 1800 booth, where fans could get their hands on the game for the first time and take their own special gamescom memento with a 19th century style photo. Chris aka Ubi O5igther from the community team was also at gc2018 and we found some time for a relaxing foto session. And the booth was packed – with queuing times starting immediately to ramp up as soon as the convention opened. Even with long waiting times, thousands were able to get their first impressions for the seventh Anno title in the series and we tried to get as much feedback as possible. If you visited us and played the game, feel free to share your take on the gamescom demo in the comments! Playing the game was obviously a highlight but we had some more Anno cards up our sleeve. On our big Ubisoft stage, we gave you a glimpse on our newly announced features such as the expeditions, the museum and blueprints. Hundreds of Anno fans gave us not only great company during the daily shows, even in that loud environment of a packed convention hall everyone could hear the “Anno Union” battlecry of the Anno fans (seriously I was surprised how loud you guys can get). Love Island, our throwback to the story “mutiny on the bounty”, became quickly a running gag during the convention. 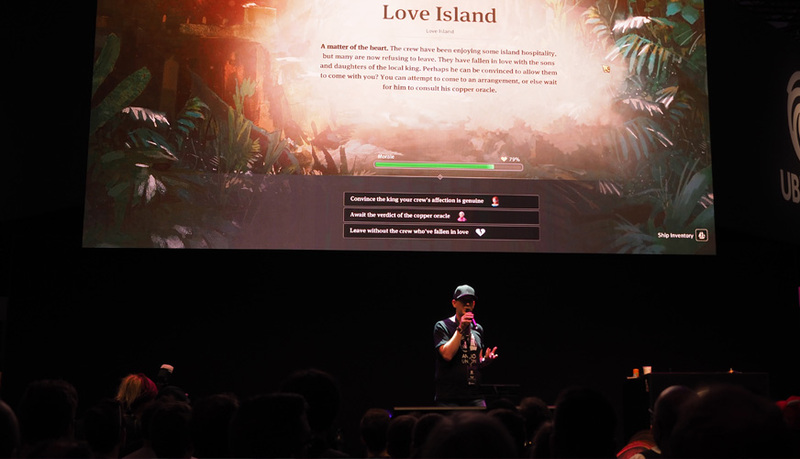 During our UbiLounge presentations, we not only gave you a live gameplay demonstration of the actual savegame shown to the press, you could also ask questions in the roughly 1 hour long panel – all in the spirit of the Anno Union. While we mentioned in advance that you should be early, you guys managed to pack the Ubilounge to its absolute max of sometimes 60 and more people attending each master class. Altogether, several hundred Anno fans watched, listened and asked questions during the presentations. 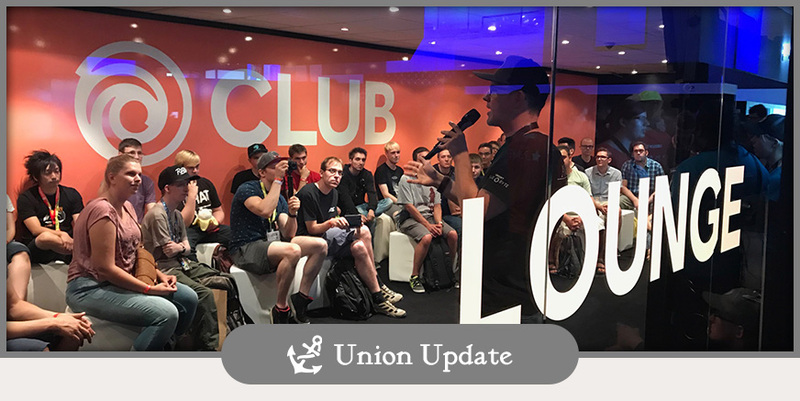 A very special highlight for us was the Union community dinner on Thursday evening, where we invited almost 30 Anno fans to come together to enjoy the company, the food and chatting about Anno 1800 and the Union. Even after the restaurant closed its doors, we all had a hard time to call it a day, so it went on until almost 1am. A truly brilliant Anno evening and we are thirsty for more, it might now have been the last time we host such an event? We compeletly missed to get all attendees on one picture, must have been the nice atmosphere which distracted us. But how about the Anno Union members being unable to attend? To give you a chance to see what we have shown to press and fans for yourself, we decided to will host an AnnoCast stream this Thursday, where we will not only recap the convention but also show you the actual gameshow build in action, including the content we have shown to the press and to fans in the UbiLounge. Last week, we asked you for questions and as this Union Update is already quite long, we decided to answer many of them in this Thursday’s stream. You also remember that we talked about some nice Anno 1800 goodies during gamescom? To give you a chance to get your hands on the Anno 1800 gamescom loot, we will raffle out several of the pieces during the show, including also some nice giveaways from our friends at Corsair Gaming. In upcoming Union updates, we will start to kick off a new fan initiative and present you the finalists of the Union ship vote. But rest is for the wicked and there is still a lot to talk about up to February 2019. 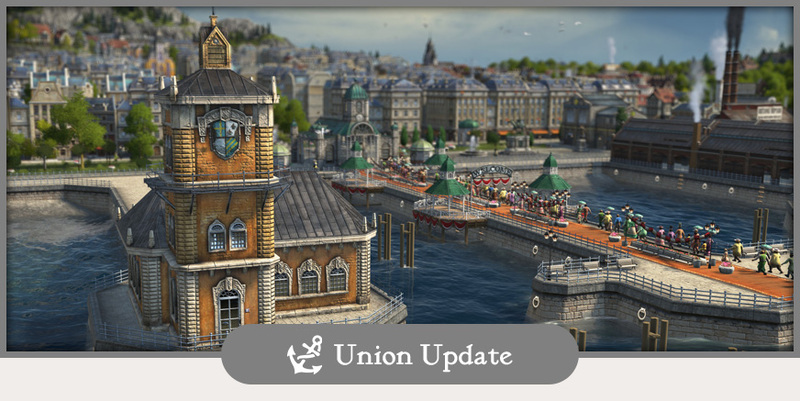 With a big Naval combat highlight in the making, more frequent streams, the next round of our Union focus test and even some not yet revealed features – there is a lot of things to look forward to so keep a close eye on Union Updates and Devblogs to come.